India's space programme provokes the predictable 'butter-versus-guns' debate that surrounds any foray by a developing country into high-cost sectors where the returns are not tangible. The censoriousness is understandable when a country with the largest number of malnourished children in the world sets aside sizable funds for developing missiles. But what of the space programme? Who can disregard the contribution of the Indian Space Research Organisation (ISRO) to so much of our daily lives? ISRO satellites provide services in communications, weather forecasting, disaster warning, ocean monitoring and in smaller measure to education. These are services that would have come with a stiff fee if India had to purchase them. Yet, ISRO’s interplanetary forays such as the Chandrayaan mission to explore the lunar atmosphere and the more recent Mars Orbiter Mission have come in for much criticism as being a waste of money. The refrain in parts of the western world has been that India’s level of poverty did not warrant sending a costly spacecraft like the Mangalyaan to the red planet. More so, because it had no scientific or social value and was merely a technological achievement. Sensitive to these charges—made at home too by former ISRO bosses—India has made much of the fact that Mangalyaan, which created history by being successful at its very first launch in 2014, cost very little compared to similar missions. It spent just US $74 million, compared to US $670 million by NASA of the US on its Mars exploration programme christened MAVEN. As Prime Minister Narendra Modi said pointedly, ISRO spent less on Mangalyaan than the producers of the Hollywood space fantasy Gravity did (US $119 million)! But then its payload was minimal at 15 kg compared to the 65 kg of complex instrumentation that MAVEN carried. Are clipped costs the intrinsic advantage that ISRO enjoys as it cobbles together well-tested components in its launches? That is an edge that comes from cheaper labour—our scientists and engineers are paid a fraction of what their western counterparts get—and parts. This question follows from reading a global report that showed ISRO has too thin a patent portfolio unlike the US, German and Japanese space agencies. While NASA has 2,865 patents, the German Aerospace Centre DLR comes next with 2,307, followed by the Japan Aerospace Exploration Agency JAXA with 573. 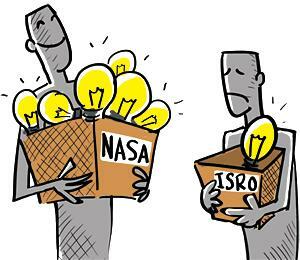 ISRO’s tally is put at a measly 178, although the organisation’s website claims “more than 270 patents”. A confirmation about ISRO’s not-so-impressive performance compared to other agencies comes from an Indian study done recently by the Rajiv Gandhi School of Intellectual Property Law at IIT-Kharagpur and the CSIR’s National Institute of Science Communication and Information Resources, Delhi. In the first analysis of ISRO’s patents, the report says the organisation has shown “average level performance” on the number of patents it has secured—an indicator of the technical prowess of the organisation. Necessity is, undoubtedly, the mother of all invention. In ISRO’s case, however, this has not enhanced its IP profile despite its laudable achievements.